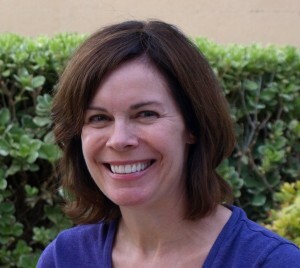 This product can be used as an instructional aid, follow-up work, or assessment. There are 7 variations of the decimal place value mat / chart included in this product, all intended to be printed in landscape orientation on regular printer paper or card stock (8 1/2 x 11”). *Special note: Some table borders may not display in .PDF format on your monitor. However, they do print properly! o Chart 7: Place value numeric values and place value names using “ones” (can be used as a chart, if desired, or as an answer key for place value name labels). 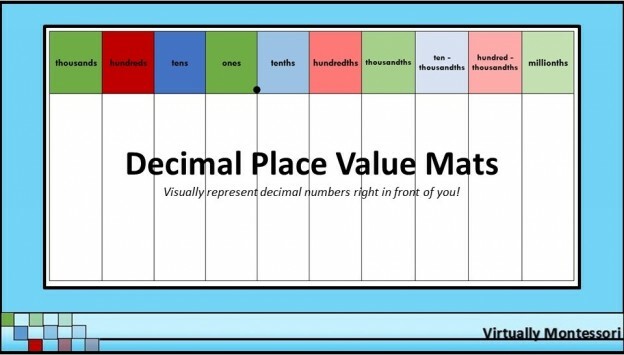 The decimal place value charts can be used to introduce the decimal system in relation to whole numbers. They can also be used with Montessori decimal cubes or numeral cards to learn how to say decimal numbers, and add or subtract decimals. Additionally, you can use the labels in various lessons to introduce the names and values of the places. Children can use these materials independently or with another child as a center activity or on the math shelf. The charts could be printed and written on as practice sheets for writing decimal numbers, and adding and subtracting decimals, or laminated for reusable practice sheets. The colors of the place values correspond to Montessori place value colors. The decimal places are lighter shades of the whole number place value colors to represent that place value being broken down into more and more pieces. For example, the tens place is royal blue, the tenths place is light blue (tens being broken down into smaller pieces) and the ten-thousandths place is even lighter blue, (indicating even smaller pieces).